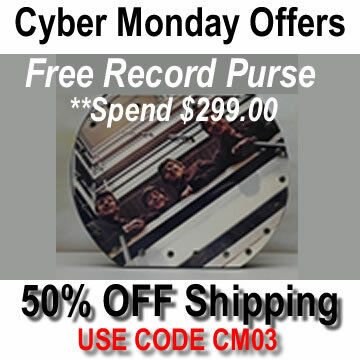 Beatles Cyber Monday Deals Start Now: 50% Off Shipping applies to all orders (once per customer) discount refelcted in the shipping price when coupon code CM03 is appiled at checkout. when Order sub total=$299.00 or more! This attractive purse The Beatles - 1962-1966 features the original vinyl record album on one side and the decorative art album cover on the reverse side. Covers are laminated for durability and strength. Both sides are securely riveted together.